Spring this year in Pennsylvania has been wet, complete with high water in rivers and streams; flooding in some communities; and conversations about the weather impacting outdoor fun and what’s growing. DCNR is involved in a number of efforts to address the impacts that heavy rain can have, including supporting and employing green infrastructure and planting trees along streams. Another unique practice is encouraging the use of biochar in rain gardens and urban tree plantings to assist plant growth and adsorb water. There is evidence of use of biochar all the way back to ancient South American civilizations, and has recently be proven as seen an eco-friendly soil amendment. Biochar is charcoal that is ground down to a certain size, and added to the soil. (Biochar is not briquettes, like you would buy in a bag for your grill, but smaller pieces made from organic matter, such as wood, that is processed at high temperatures). As wood is heated in a controlled environment, it chemically breaks down, leaving carbon behind. The hydrogen and oxygen that made up a portion of the wood fiber are driven off as gases and burned. When this charcoal is pulverized and added to the soil, it is called biochar. This material has a large, porous surface area that attracts and retains soil nutrients, such as nitrogen, phosphorus, and potassium. These essential elements often leach away and enter the water system if not taken up quickly by the plants. Biochar is not a fertilizer, but rather a very effective holder for plant nutrients and it provides habitat for microorganisms. The biochar acts like a battery that collects and stores these essential compounds for plant growth, but then releases it back to the plant when needed. Because biochar is nearly pure carbon, it cannot rot, unlike wood mulches. It is a long-term investment in the soil that will last for centuries. Each pound of charcoal placed in the soil keeps three pounds of carbon dioxide out of the air. Biochar is very porous and can hold up to six times its weight in water. It acts almost like a sponge, absorbing, holding, and keeping water and nutrients available for plants. This makes biochar a good addition to a rain garden. The pores also function as small condominiums holding bacteria, nematodes, fungi, protozoa, and other organisms that digest and recycle nutrients in the soil. In 2017, DCNR’s Bureau of Facility Design and Construction was working with staff at the Governor’s Residence in Harrisburg to design and install a rain garden at the property along Front Street as part of a number of sustainable practices. Intern Zoe Roane-Hopkins, attending Penn State pursuing a degree in landscape architecture, was working on the project and had been introduced to biochar and how it can be used. She felt adding charcoal to the rain garden would be a good idea and made this suggestion to her supervisor, who approved this project, and her vision moved forward. The biochar put in the rain garden at the residence is made from low-grade hard and soft woods grown in Pennsylvania. 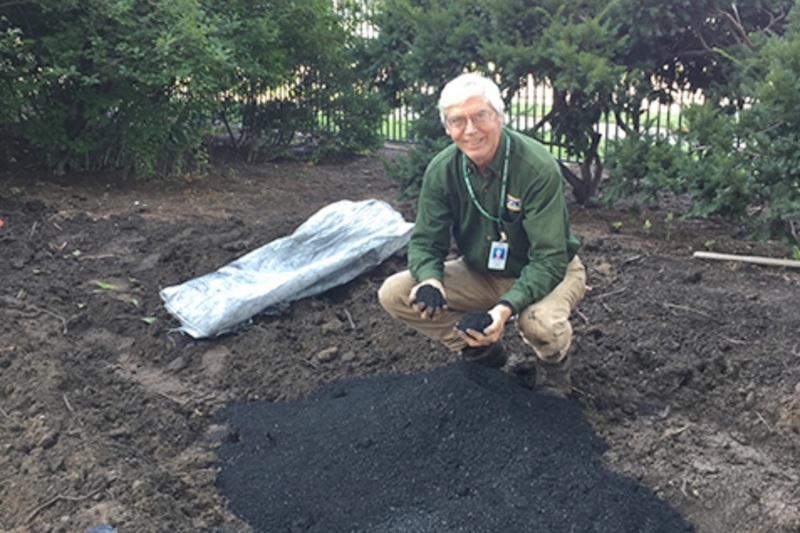 This work at the Governor’s Residence is one more step forward in letting others know about the benefits of biochar. This spring on a farm in Auburn, Schuylkill County, DCNR’s Woodland Stewardship Coordinator Gary Gilmore was assisting the landowner in making biochar to be used for the first time in urban tree plantings in Pottsville and Orwigsburg. Because biochar assists in keeping plants hydrated, it’s a perfect addition to urban tree plantings, which are often surrounded by sidewalk or asphalt. In addition, biochar can assist with trapping pollutants, such as oil or anything running off streets, pavements, and parking lots. Once trapped, microorganisms in the soil can then digest and degrade these pollutants. Non-marketable trees are those which are not being used for lumber or are undesirable. Those trees could be recycled and made into charcoal. “Trees can’t be landfilled,” Gilmore said. Some communities turn trees they have removed into mulch. Charcoal creation could be another option. Any type of hard or soft wood can be used as long as it’s not chemically treated. DCNR’s Bureau of Forestry has been working closely with teachers and students at the Cumberland-Perry Area Vocational Technical School (Vo-Tech) on making biochar, and using it in bare-root tree planting experiments at the campus. The building trades classes take the cut-offs from the lumber used to build model homes and turn them into charcoal. This has drastically reduced the amount of waste that used to go into dumpsters and then landfills. This charcoal is then passed to the students in the horticulture classes to process into biochar. They crush the charcoal and add it to compost. This material can then be used in the green house for potting mix or in the newly installed bare-root nursery. Many communities around the area are starting to plant bare-root stock for shade trees. The Vo-Tech horticulture department wants to help supply that need since they have the space, the program, the students, and the interest. Using biochar will help make it easier to care for the plants by holding nutrients, holding water, and making it easier to pull the trees when they are large enough to sell. It would have been hard to imagine several years ago that the “waste” from building trades could be used to help the plants grown by the horticulture classes in the same school. The school has purchased a portable mill through a USFS grant. To learn more about biochar and urban wood utilization, visit the DCNR website or send email to DCNR's Gary Gilmore at: ggilmore@pa.gov.